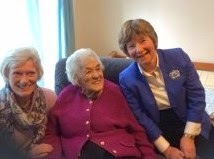 Betty celebrated her 100th birthday on Saturday 28th March 2015. County Secretary went to visit Betty. Congratulations go to Brogan Clark. Brogan has been attending the Scottish Golf Academy over the last few months, a feat in itself to get into. Brogan won the Academy Winter Series Final which was played over the Jubilee Course on Sunday 8th March. The conditions were very tricky with high winds and extremely slick greens. Obviously Brogan managed to keep her cool and triumph. Brogan is a member at Lochgelly and Dunnikier Park Golf Clubs and is an active member of the Junior Section and also a member of the Junior Cuthbertson Cup Team. Well done Brogan, congratulations from all in Fife County and keep up the good work.